I'm not really a fan of Critical Mass, mostly because their routes of choice seems rather aimless. 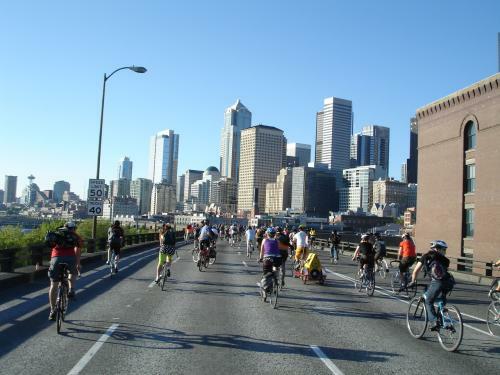 However, on Friday, riders made an epic ride from Downtown Seattle on the Viaduct up to Golden Gardens. This is the sort of ride I'd like Critical Mass to do. block lanes of a highway deserve drivers' hate or perhaps pity? As it turns out, most of 99 is actually open to cyclists. From Mercer Street onward, cyclists can use the road, though I would be scared to do so outside of a pack. This entry was posted in Uncategorized and tagged aurora, critical mass, drivers, illegal. Bookmark the permalink.